Shares of most North American airlines fell after the U.S. and Canada announced they were grounding all Boeing 737 Max 8 planes, and banning the aircraft from its airspace on Wednesday. In Toronto, shares of Air Canada — which has 24 of the Boeing aircraft in operation, and is among the biggest users of the aircraft in the world — fell nearly two per cent after the announcement from Ottawa in the morning. But, shares recovered some losses to close down 0.1 per cent at $32.01. 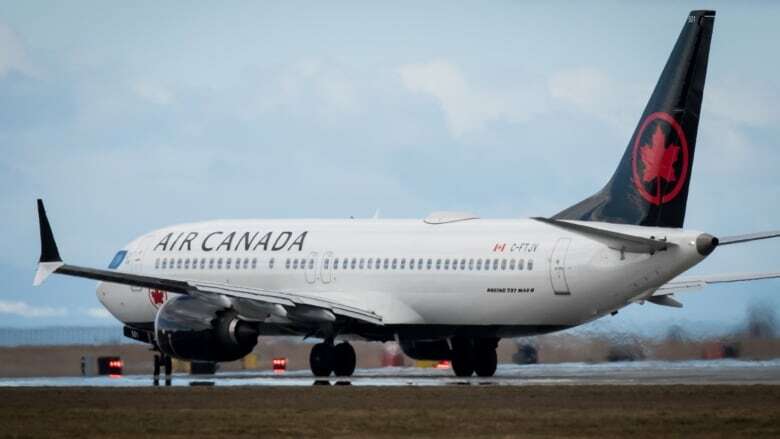 The national carrier said it would immediately comply with Transport Canada's safety notice to shut down operations of the aircraft, and its cancellation and rebooking policies were in place with "full fee waiver" for affected customers. "We are working to rebook impacted customers as soon as possible, but given the magnitude of our 737 MAX operations, which on average carry nine to twelve thousand customers per day, customers can expect delays in rebooking and in reaching Air Canada call centres," the airline said in a statement. "We appreciate our customers' patience. Customers are further advised to check the status of their flight on aircanada.com prior to going to the airport." Shares of WestJet Airlines fell 1.6 per cent to close at $19.60, also going into the red from positive territory in the morning. The Calgary-based carrier has 13 Boeing 737 Max 8 in its fleet. WestJet also announced on Twitter that it was complying with Transport Canada's decision, and four of its planes operating within North America had landed safely at their destinations. This decision has an impact on the travel plans of our guests and we ask for understanding as we work to rebook all guests affected as quickly as possible. "We have implemented flexible change guidelines for those guests booked on the MAX who wish to make changes to their travel arrangements," WestJet said on Twitter. Shares of the two airlines have fallen more than three per cent this week after the crash of the Ethiopian Airlines plane that killed all 157 people on board, including 18 Canadians, on Sunday. Budget airline Sunwing was the first Canadian airline to suspend flights for four of its Boeing 737 Max 8 planes on Tuesday, following a move by airlines and countries around the world after the second fatal crash of the Boeing plane in recent months. Tim James, analyst at TD Securities, said operations for Canada's two biggest carriers — Air Canada and WestJet — could be negatively impacted by the aircraft grounding. "We believe that both airlines have some fleet flexibility to be able to re-accommodate passengers if 737 MAX flights were negatively affected for any reason," James said in a note. "If a 737 MAX grounding was prolonged, we believe that this could also negatively affect MAX production rates and deliveries." In the U.S., shares of Southwest Airlines, which has the most Boeing 737 Max planes in operation globally, slid after the U.S. announcement, but closed 0.4 per cent higher. Shares of planemaker Boeing, meanwhile, closed up 0.5 per cent after trading lower for much of the day. Its shares have fallen more than 10 per cent this week, dragging down the Dow Jones industrial average.